On 23rd-26th September, PHARMA TEST held Sales Seminar at their Headquarter in Hainburg. The event was participated by the agents from Europe and also Pharma Test's group of companies from India and Indonesia. After the seminar, the agents also have the opportunity to visit Wuerzburg city, which located 1.5 hour from Hainburg by train. It was a good place for relaxing and discussing the future of the business. All members of PT. Pharma Test Indonesia go to LOMBOK for vacation at 15th-17th of May 2014. The purpose of this vacation is to strengthen the relationship in our team and relax from the daily working activities to generate more ideas to serve the customer better. The vacation arranged by Mr. Yuli Anggoro (our technical manager) who was responsible to make all the planning. 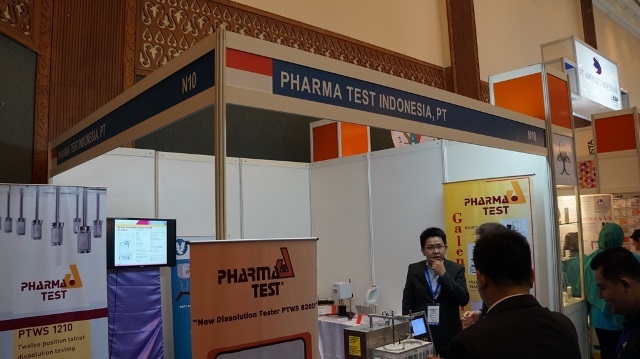 PHARMA TEST INDONESIA had participated in Lab Indonesia Exhibition starting from 7th to 9th May 2014. We have a booth at N10. Our CEO from Germany Mr. Bjoern Fahler came to support us in this exhibition. During the event, we displayed 3 main instruments from Pharma Test such as Disintegration Tester, Hardness Tester and Friability Tester. We also launch our new generation of Dissolution Tester type PTWS 800D which equipped with a new firmware and now available with Large Colorful Touchscreen display. This new instrument will be ready for the market in June 2014. On Thursday 6 March 2014, PT. 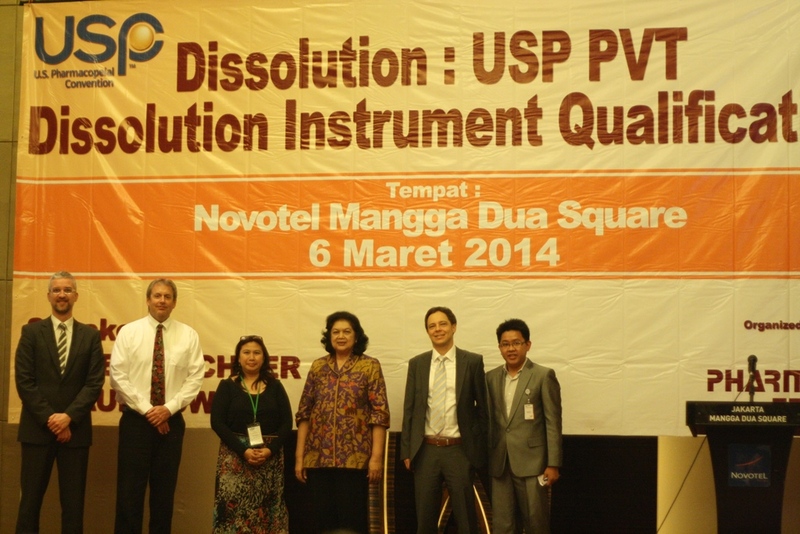 Pharma Test Indonesia has successfully organized a Seminar from U.S. Pharmacopeia with the topic "Dissolution: USP PVT Dissolution Instrument Qualification". The Seminar was held in Novotel Mangga Dua Square and attended by 110 participants from 59 Pharmaceutical Companies in Indonesia. The main issue of this seminar is to discuss Dissolution Best Practice and how to perform a PVT (Performance Verification Test) from the USP point of view. Lab Asia 2013 Exhibition was held in Kuala Lumpur at 8-10 October 2013 located in Putra World Trade Center. Lab Asia is an exhibition that specified for Laboratory Equipment. In this exhibition, PT. Pharma Test Indonesia sent a representative to meet the customers and our agent in Malaysia. The agent of PHARMA TEST in Malaysia is Matrix Analytical Sdn, Bhd. Together with the Lab Asia, there was also Chem Asia Exhibition that took place at the same venue from 8-9 October 2013. Chem Asia 2013 was more specific for raw material and chemical. 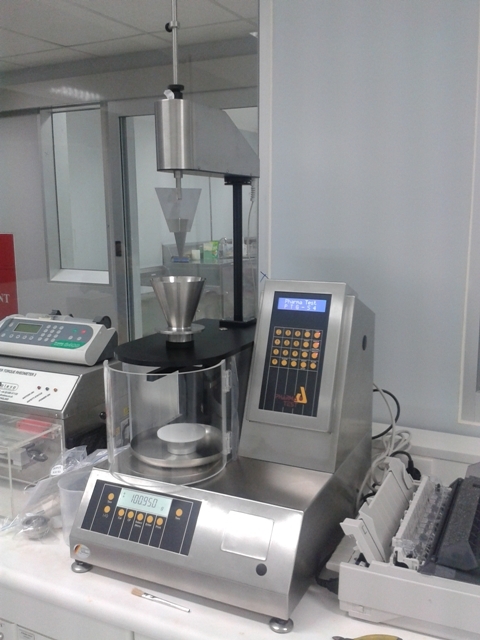 This month (August 2013) we have just installed a new unit of Fully Automatic Powder Tester PTGS-4 at one of our customer site. The number of this instrument in Indonesia increased within the last 2 years. This indicates the importance to test all basic parameters from every incoming powder or every powder used. In Indonesia, mostly the customer test the characteristic of powder using a funnel and the time recorded manually. 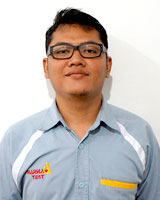 The manual testing is not too accurate and also increases the uncertainty of the result caused by human error. By using the automatic powder tester, we hope to increase the effectiveness and also the accuracy during powder testing. Hi visitors, di posting ini kami akan menceritakan mengenai event Asian Sales Seminar yang diadakan oleh PHARMA TEST di Phuket, Thailand pada bulan Februari 2013 dan berlangsung selama 3 hari. Sebenarnya agak sedikit terlambat review ini, tetapi seperti kata pepatah "Lebih baik terlambat daripada tidak sama sekali". Oleh karena itu kami memutuskan untuk tetap membuat review ini. Acara merupakan acara rutin dimana para distributor PHARMA TEST di Asia berkumpul untuk mendapatkan update terbaru mengenai produk-produk baru Pharma Test dan juga untuk sharing pengalaman di masing-masing negara. 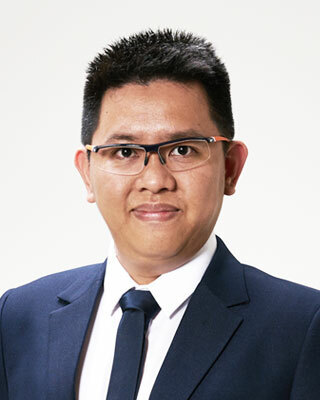 Acara tersebut dihadiri oleh wakil dari Malaysia, Jepang, Thailand, India, China, Korea, Vietnam, Kamboja, dll. Regulations on biowaivers already existed at that time, according to which an in vitro instead of an in vivo assessment could be used to assess bioequivalence for a new tablet or capsule, or a new formulation of an existing immediate release dosage form. On the basis of the in vitro assessment, a new drug product could be considered bioequivalent to its reference product, without having to perform a pharmacokinetic study in human volunteers. To generally describe the use of an in vitro assessment to waive the need for in vivo (bio) studies, the term biowaiver was coined. As this term was originally applied to waiving in vivo studies for registration of lower dosage strengths of drug products, the more precise term "BCS based biowaiver" is sometimes used to distinguish biowaivers based on BCS considerations from biowaivers used for the approval of lower dose strengths of a product. Scope : The dissolution toolkit provides a description of best practices associated with the mechanical calibration and performance verification test for the USP basket and paddle dissolution apparatuses and test assemblies. The best practices have been developed based on experience gained by the USP laboratory (9, 13, 14, 15) and with suggestions from the USP Expert Committee on Biopharmaceutics. While not a standard requiring rigid compliance, the dissolution toolkit is intended to provide information aiding the dissolution laboratory in the effort to obtain valid dissolution testing results. This general information chapter Apparent Intrinsic Dissolution Testing Procedures for Rotating Disk and Stationary Disk 1087 discusses the determination of dissolution rates from nondisintegrating compacts exposing a fixed surface area to a given solvent medium. 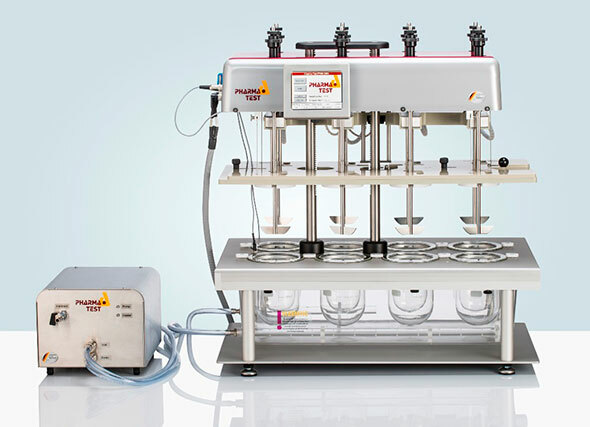 Compact, as used here, is a nondisintegrating mass resulting from compression of the material under test using appropriate pressure conditions. A single surface having specified physical dimensions is presented for dissolution. Determination of the rate of dissolution can be important during the course of the development of new chemical entities because it sometimes permits prediction of potential bioavailability problems and may also be useful to characterize compendial articles such as excipients or drug substances. Intrinsic dissolution studies are characterization studies and are not referenced in individual monographs. Information provided in this general information chapter is intended to be adapted via a specific protocol appropriate to a specified material.